Anyone on here thought about training there dog to find these delicious little treats. 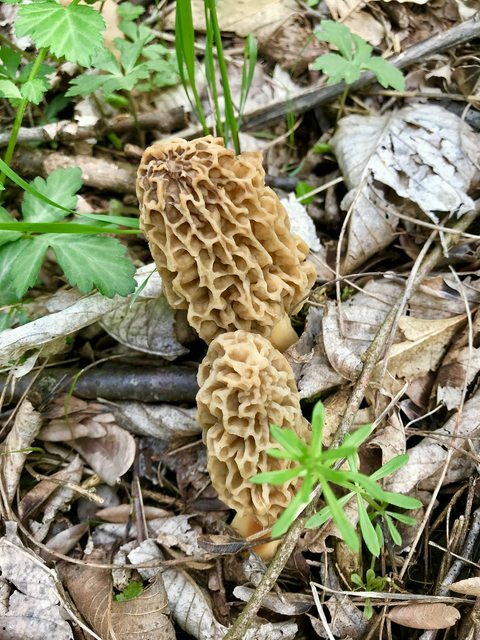 Could earn some extra $ in a hurry on a good mushroom season. I have no idea whether this theory has any validity or not, but I try to strongly discourage my dogs from going anywhere near mushrooms. If they sniff one I will actually scold them... Simply because I watched a friend's dog go through mushroom poisoning after eating some poisonous ones and it was not something I ever hope to see again. All my GWPs have been hellions on running down turkey tracks and flushing them. Happened yesterday in a corn field ... Mushroom season is turkey season and I keep my dogs out of the turkey woods then. I wear camo and hunt mushrooms as quietly as possible so as to not disturb my turkey woods. Many days I am hunting both in the same day and woods. In some states it is illegal to run dogs on public lands that time of year for similar reasons. Should be a good weekend down here for rooms. Actually been a while since turkey and Morels coincided. Looking forward to next week. Bought over here, You should be in em this weekend with the rain in IA. RowdyGSP wrote: I have no idea whether this theory has any validity or not, but I try to strongly discourage my dogs from going anywhere near mushrooms. If they sniff one I will actually scold them... Simply because I watched a friend's dog go through mushroom poisoning after eating some poisonous ones and it was not something I ever hope to see again. Where are you hosting your photos? Huxley and I found the first of the season, but I haven't used Photobucket for ages. Last edited by Misskiwi67 on Sat May 05, 2018 9:28 am, edited 2 times in total. That is a Cute Photo! MissKiwi.